Nationally acclaimed bluegrass musician and composer Keith Little is a multi-instrumentalist including guitar, banjo, mandolin, and fiddle. A Sierra Nevada Foothill native, with roots also in Nashville, Keith performed on the GRAMMY award winning recordings The Grass Is Blue and Little Sparrow by Dolly Parton, Another Country by the Chieftains. His compositions have been recorded by Crystal Gayle and Tim O’Brien, among others. 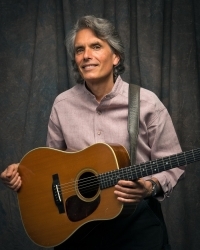 Keith is also a featured member of the David Grisman Bluegrass Experience and the Peter Rowan Bluegrass Band and is an honorary lifetime member of the California Bluegrass Association. Delta blues ethnomusicologist Dr. David Evans, regarded as one the most important contemporary blues musicologists, as well as a brilliant country blues guitarist, will perform. Opening is classical guitarist Daniel Roest, who lives and performs in Northern California and has given countless solo and ensemble performances in nearly every kind of venue. With a broad range of styles to select from, his performances shift gears through continents and periods, aimed at pleasing all ages. This event has been viewed 399 times.